Shampoo for after highlights, damaged or chemically treated hair. Not just for blondes - its for racy reds and buxom brunettes. If its good enough for Britney it`ll be good enough for you. 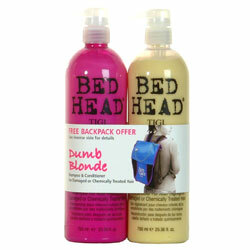 Dumb blonde shampoo delivers mega moisture, explodes with lather and adds super shine to your hair. Feed your protein starved hair with ProVitamin B5, wheat and soy. Adjusts the ph of your hair to preserve your colour and revitalise your scalp, use with dumb blonde reconstructor for the smartest way to treat your hair. Created for blondes by blondes and all the colours in between. Salvage the wreckage with this protein packed moisturizer including wheat, soy Keratin and Pro Vitamin B-5 complex. Use as a PH balancer, daily conditioner, or as a hair mask - leave on 5 -10 minutes. Wet hair thoroughly, lather and rinse. Repeat as necessary. Follow with Dumb Blonde Reconstructor to complete regimen. For after highlights, damaged or chemically treated hair. Not just for Dumb Blondes - its for Racy Redheads and Buxom Brunettes too. Dumb Blonde Shampoo delivers mega-moisture, explodes with lather and adds super shine. Feed protein-starved hair with Provitamin B-5, wheat and soy. Adjusts the pH of your hair to preserve your color and revitalize your scalp. Use with Dumb Blonde Reconstructor for the smartest way to treat your hair. Created by blondes for blondes and all the colors in between. Use as a pH balancer, daily conditioner, or as hair mask leave on 5 to 10 minutes. Created by blondes for blondes and all the colours in between. Not just for the Dumb Blondes its for Racy Redheads and Buxom Brunettes too. Salvage the wreckage with this protein-packed moisturizer including wheat, soy, keratin and Pro-Vitamin B-5 Complex. Conditioner Aqua, (Water), Behentrimonium Methosulfate, Ceteraryl Alcohol, Stearyl Alcohol, Parfum (Fragrance), Trimethylsiloxyamodimethicone, Hydrolyzed Wheat Protein, Dimethicone, Polysorbate 60, Cetyl Alcohol, Glycerin, Panathenol, Sodium PCA, Ketatin Amino Acids, Glycine Soja (Soybean) Protein, Methyparaben, Propylparaben, Methylisothiazolinone, Metylchlorisothiazolineone, CI 19140 (Yellow 5).